The Tokyo exhibition rounds have always been a great success for D1, attracting a great number of spectators, not to mention TV coverage. The TV Tokyo HD video cameras were set up around the temporary tack catching all the action from the week-end. 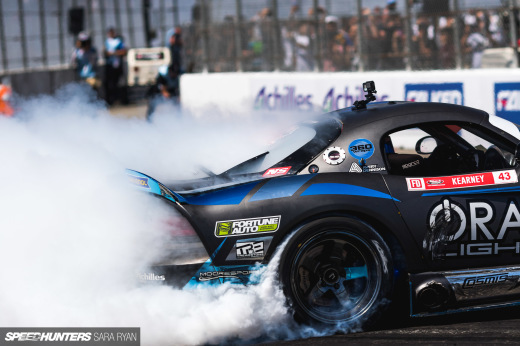 After seeing Orido rip up the tarmac in Odaiba over the years, there was something not quite right with his driving yesterday as he was struggling to drift smoothly. 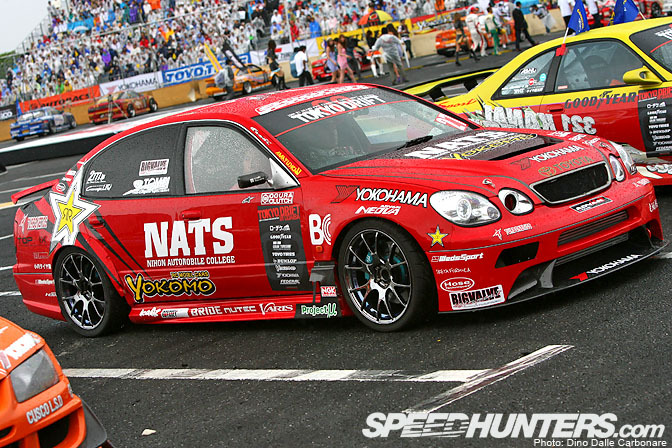 It looks like more set-up work is needed to fine tune the NATS JZX161. He managed to make it into the Best 8 after beating Kuroi, but Tezuka got the best of him in the following battle. Hopefully he will be back in form for the next round in Okayama next month. Kuma is always the man, I could count on him to throw the car sideways way before the corner entrance, perfect to get wide panning shots. 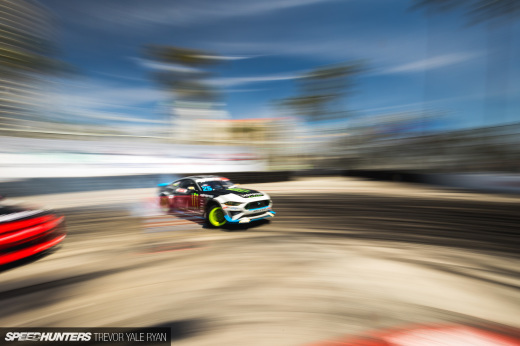 Hats off to him for not being afraid to smash his Evo X! 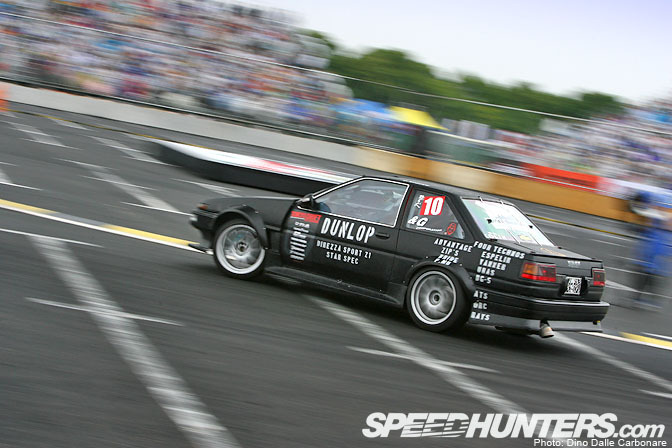 Hibino's 320 PS DRoo-P AE86 was looking and performing great yesterday. He managed to work his way up all the way to the Best 4, where he got beaten by Tezuka. Here he is pulling one of his many contorted faces. Quite a character! The look of this thing from the rear is pure class, check out the low mounted spoiler and those massive overfenders! The RB25 seems pretty built, running a GReddy intake plenum and the single throttle conversion, not to mention that big blower. Notice the shrouding around the radiator which helps to expel hot air from the vented hood. I loved how the big and aggressive rear end of the Skyline looked out in Odaiba, although there was a little mistake with the number plate! Orido put on his war face before heading out for the Best 16. I'm told he never leaves home without his cowboy hat! This is where the Drift Samurai does his work. I found it rather amusing that he keeps his samurai sword next to him at all times…might come in handy when needing to slash a few competitor's tires he he. …followed by the House Nation Dancers who put on a high-energy dance routine while the Team Orange guys drifted around them. By the end of the performance the five girls had stripped down to very colorful costumes! 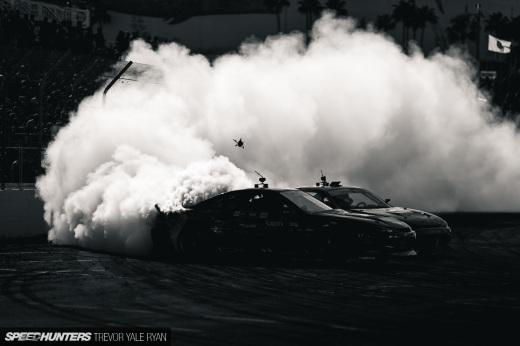 The rain eventually stopped, which meant tire smoke, finally! 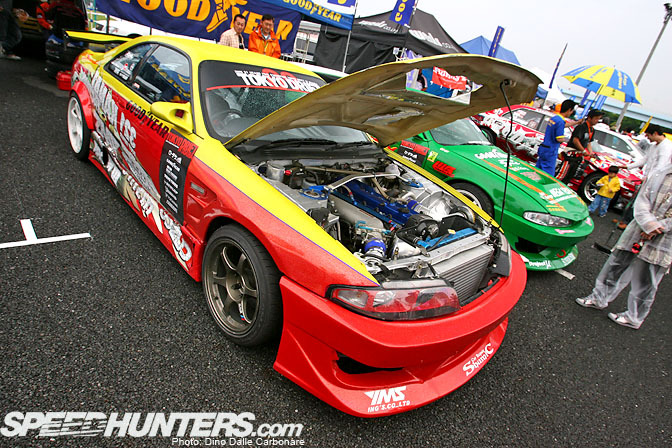 Here is Takahashi doing his best to light up his GoodYears with those 800 horses! 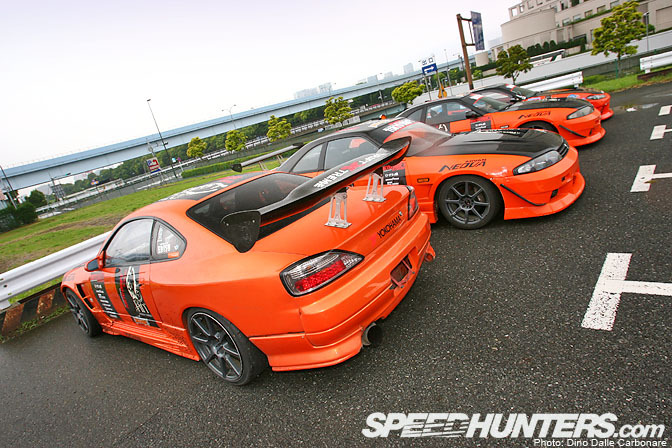 Team Orange had a total of 8 cars at Odaiba. I hadn't seen the pair of Skylines since the last Big X event back in 2005. 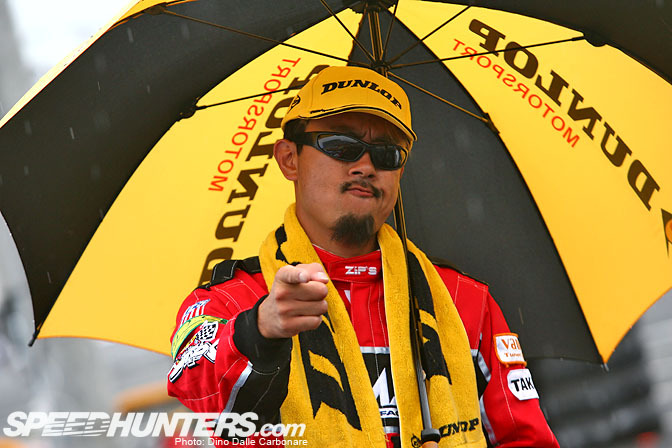 I don't think Manabu Suzuki gets enough mention, he is the voice of D1 and does a great job of injecting lots of enthusiasm into the commentating and judging. He's on that mike non-stop throughout D1 events, I wonder if he has ever lost his voice!? How about this for something different! 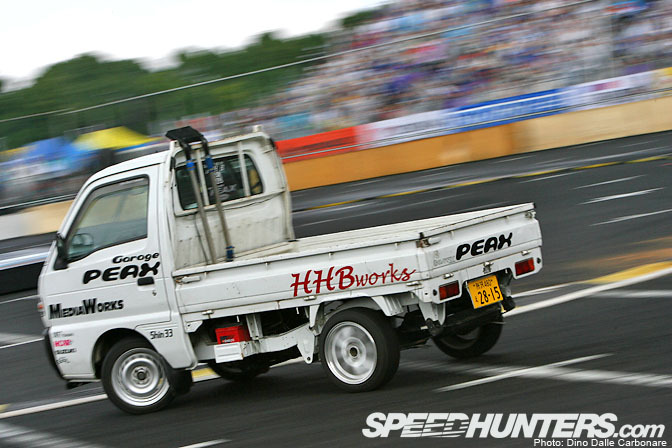 Drifting Kei-trucks! This is what Japanese farmers use across Japan, the best way to get around in the countryside. Tuned and set up for sliding, these things look like they are about to tip over forward most of the time, as there is hardly any weight over the rear wheels. 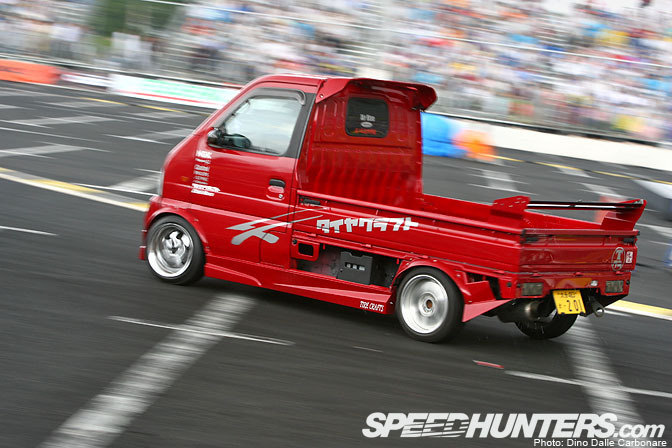 We have already seen this Suzuki Carry at the Exciting Car Showdown in Nagoya. With its mighty 100PS it was able to get sideways and hold a nice smooth slide around all of the D1 track! Too bad the driver ended up crashing it into the wall shortly after this picture was taken! 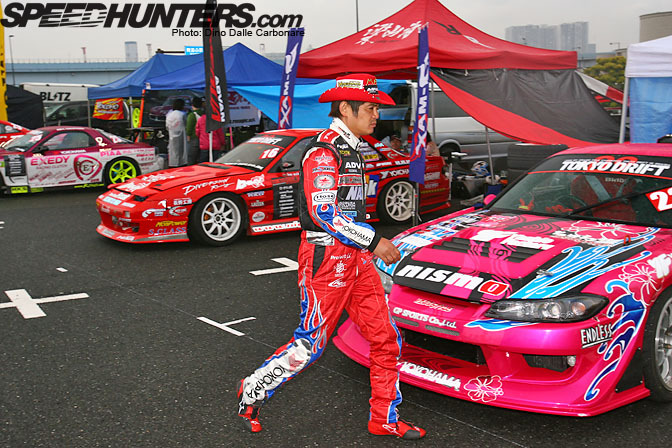 There is more action coming from Odaiba coming up soon, so make sure you don't miss it! I don't think Manabu Suzuki would ever loose his voice, otherwise probably he would compensate it with his laughter! Great to see more pictures of the drifting kei trucks! Lovely detail on the Mazda kei truck is the oilcooler on top of the cabin! Please samurai sword for desctop. Murayama's ECR33 does look pretty awesome. Probably the best looking car in D1 eh? & Dino - at the FlyRat lot next to Up Garage there is a R32 with the wildest overfenders Ive ever seen. I get a bit distracted by Skylines myself as it happens. The Team Orange R33's are realy a rare sight! What is WRONG with you people? Ogling at the samurai sword? Debating Manabu's manly voice?! Caption Competition = GO! FTMFW! I say he's pointing to... ummm...the tyres...on aaahh... yeah, the other car and saying "That is bald man! I swear!" And the other guy is going, "That's my car you're talking about man. Show some respect!" Nomuken: "What the hell are those ugly shoes doing in the middle of the track??" Other guy:" I Swear, they are not mine"
Guy in the background: " shoes, shoes, shoes, i think im going crazy!" "My umbrella girl does some pretty fancy things with my umbrella, too!" I think this is how it's going...Takahashi- "Nomuken, I'm telling you even if she took off those boots she would still be taller than you!" Nomuken-"No way man those boots are gigantic she must be part of the Kiss Army." The Model Thinking-"Aw they are so cute they look just like my brother's 5-year old twins!" Kunny: "Rememeber in 2008, when I misshifted against you? Yeah, I had to scratch. That's where I got it from, but don't tell Kawabata! He got it too!" 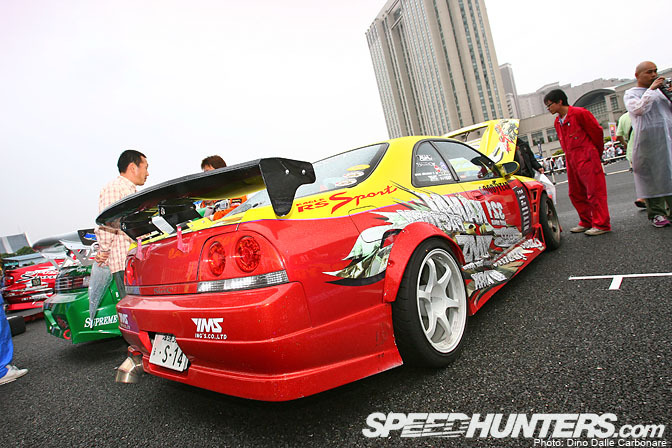 The team orange r33 are so rare to see but they sooo hot! RB25's have a single throttle stock... maybe confusing that with an RB26? D1 is so colorful... as in the cars and envioronment. I thought it was JZS161? @ Laughing Man: Yes that is correct, the RB25 has a single throttle body, whereas the RB26 has individual throttle bodies. musashi999 : If Machida Upgarage is your area why don't you pop over to Tomei which is 2 doors down? eh.. ok I'll give the caption bit a go. Big Smokey Red: yeah tough as nails mate! give it hell and she still holds up. Don't worry about the wet weather spray as this umbrella big enough to give you cover for those waves on those key moments and needed for those "One More Times". 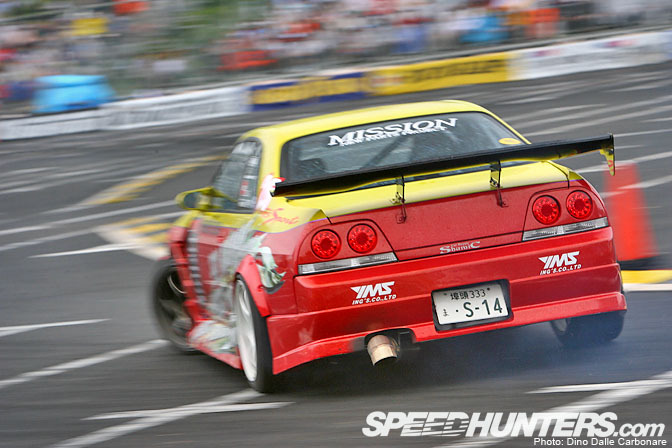 If Drift Samurai was in Australia then the Samurai in the car would be needed for road-rage. Viets do it that way. Taxi Drivers are a prime candidate for the moments. Please desktop the opening shot!!! I really like the shots of the Team orange cars as well. A good change up from the usual Evo's and STI's. Team orange seem to be getting bigger and bigger... Love the coverage. @Lorenzo - on Route 246? @Lorenzo (again) - sorted - checked the website, we even share the same zipcode. Im there!